OK, so I went to Kanab Thursday. Nice drive, particularly down through Mt. Carmel and Mt. Carmel Junction. Don't even want to think about why the distinction. Did get a kick out of - but no picture - of the sign for the Mt. Carmel Cemetary. Nope, that's not a typo. On my part. 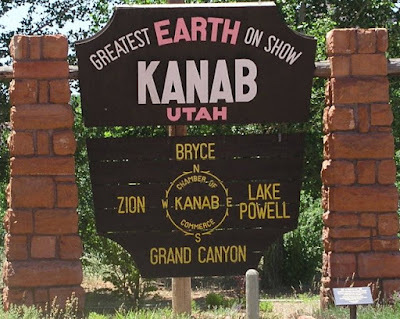 This oh-so-touristy photo of a sign heading South into Kanab is funny - a take on the Utah slogan of Greatest Snow on Earth. 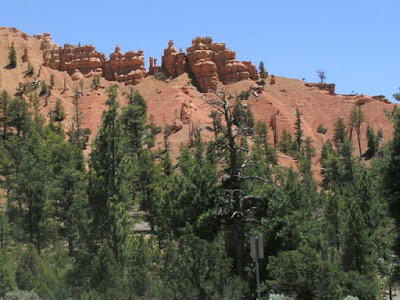 Pretty much shows why Kanab is a popular place, the unofficial gateway to several National Parks, including Bryce Canyon. Ah, yes, my fave National Park, Bryce Canyon. Had I more time on the return trip, I would have at least driven into the park to get some pix, but had to settle for some in Red Canyon. Will have to wait (again!) for the real thing. Another service call today in Logan - talk about from one end of the state to the other - but today's the last day of Logan Summerfest, so I'm taking Marilee with me.